Saturday morning I took a walk, for a class assignment in noticing things. I noticed this guy, for example, venerating a leaf. As I mentioned in my last post, I am taking a course in Mindfulness and Creativity. I was told to remember this was not a power walk – as if that were an option I had ever entertained. I do have an app on my phone that maps my walk and does an approximate rendering of caloric intake (which feels like a coupon for a free dessert), so I turned that on, but I’ve never been one of those fast and focused walkers. Not like the ones I see going around Lake Calhoun in spandex and high rise Barbie ponytails, sometimes with weights in each arm. “Amble, pause and explore,” we were told. Those are power words to me. Though I am not really sure that I did quite enough ambling. I begin on the street I had lived on for three years, in my friend Katherine’s condo. Technically the “street” is an avenue, though to me that seems a grandiose description. I took a recorder, and talked to myself as I walked. It used to be that when you saw someone doing that in the city, you figured they were hearing voices; now it attracts little notice. I take a good look at the façade of the building, the cluster of tiger lilies in front, the fur trees, one with some brown in the middle. There are benches out front, and last week while I was waiting for a friend to pick me up for breakfast I deadheaded all the peonies. Perhaps it was my imagination, but they seemed relieved. I wonder again what those purple, bell-like flowers are called. They look familiar. When I took what the kids came to know as my “prayer walks” when we were on vacation every summer up in Eagle Harbor, in the Upper Penninsula of Michigan, I found myself eager to know the names of things: the fir trees, the wild flowers, even the rocks on the beach: greenstone, agate, quartz. It occurs to me that I could take a picture. I regularly forget I have a camera on my phone. When I go home, I look the flower up. 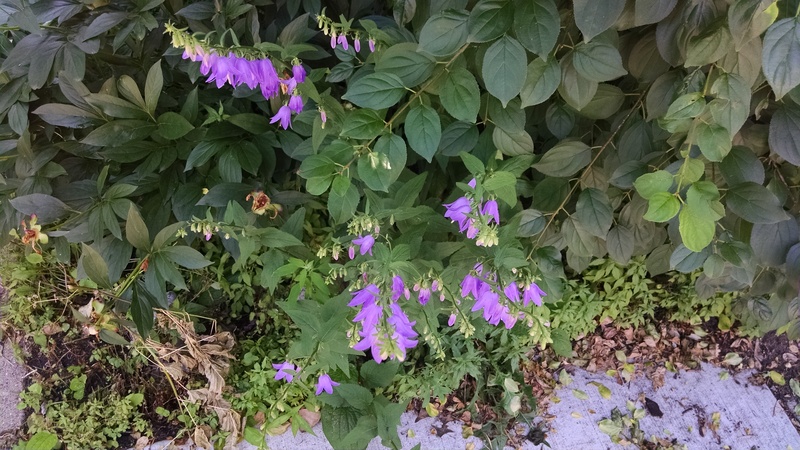 One I read the scientific name, Campanula – better known as Bellflower (duh) – I realize they are familiar because I have grown them in my own garden. I knew the names of many perennials then. These names are more blocked than forgotten. I want that knowledge back. I see more than one mulberry tree. Hard to see the berries on this one. But they’re there. It is difficult to know why people plant mulberries; they’re what my father would call a “dirty tree.” Birds love them; but birds rarely pick the branches clean; and they grow so fast it is difficult to keep them trimmed. No one seems to harvest the berries, which are supposedly good for wine, and jam. The branches that hang over the sidewalk make a mess on the concrete, and if you’re not careful, you carry that mess in the tread of your shoes. I pass the storefront where the old Butter Bakery was. They’re over on Nicollet Avenue now and I’ve been there, but it’s just a little too sanitized for me. I like the feel of this one better, capping the end of my street, between Present Moment Herbs and Books and the soapy smell of the Laundromat. I peer inside at the mural no one sees anymore. 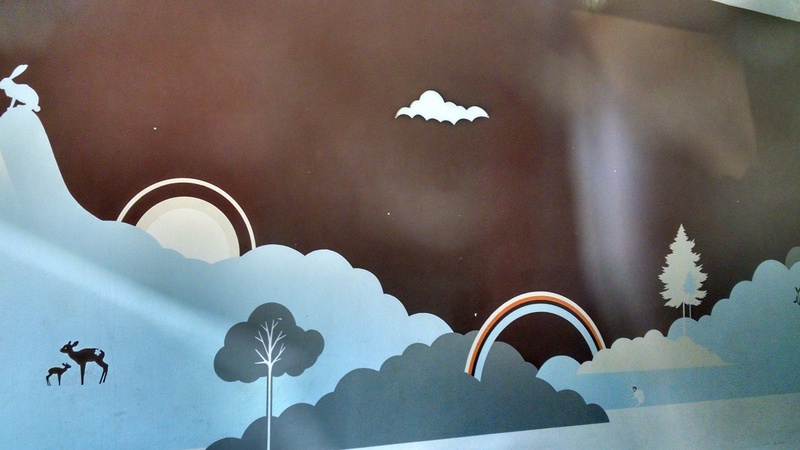 A section of the old Butter Bakery mural, seen from the outside. I have never browsed in the Present Moment. This needs to be done, but not now. Oh Paula. If not now, when? I walk up toward 38th Street, intending to loop around by my old apartment. So much for feeling young again. It is interesting, listening to the recording, how many sounds I did not notice when I was walking and talking. The neighbor hammering on his porch. The backgrounded birds. The traffic noises that I filter out without realizing it. The airplanes. As I continue, the recorder in my hand, my arms gravitate to my sides, and I forget to speak in its direction. Often I can hear my footsteps better than I can my own voice. I suppose that means something, but I do not know what. Fortunately I do not have to create a story now. I just have to pay attention. I’m also taking a mindfulness course it is amazing how long a walk takes when you realise all the things there are to see and hear. Yes. I need to take more of such walks. And not worry about my pace! This is really lovely and peaceful. I’m also undertaking a project of trying to notice things and posting a photo each day of just ‘everyday’ things. Since starting this, some of my readers have said they too are taking the time to notice things around them as well – it’s nice to be able to think and see things instead of our normal running ragged through each day. Good luck! Thank you, Deb. Given the week I had, and how long it has taken me to get to this post’s comments, I need all the luck I can get… And your photos ARE lovely. Such simple things, like squares on a floor, can bring such pleasure. Thanks for taking me on a mindful walk around the neighbourhood. It is interesting the things one notices. I would need to be mindful for I am not very observant of “things” otherwise. 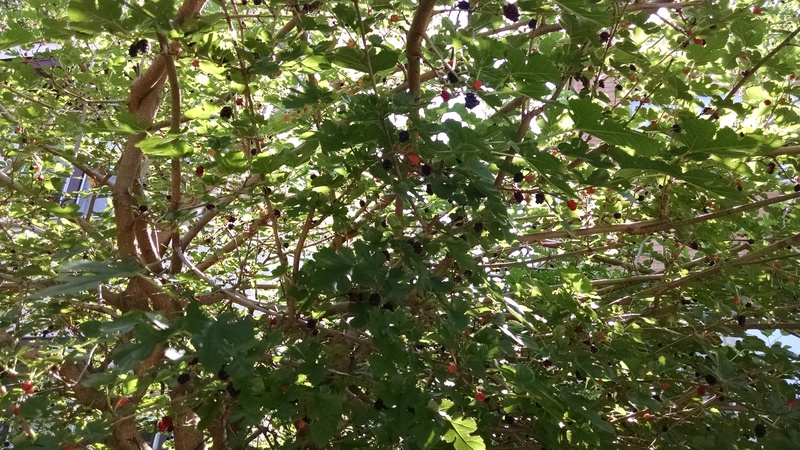 I loved seeing the mulberry tree laden with berries. When I was a child there was a huge mulberry tree a few doors over from me and we were invited to feast upon the berries whenever we wished. We often filled bowls of the berries which my mother would bake into pies or make into jam. They were particularly delicious with ice cream. But you are right about carrying the stains away on shoes – we had mulberry stained everything. But we didn’t care! The treat was worth it! I wonder if mulberries have different degrees of sweetness to them in different climates. I thought perhaps the berries were too tart for eating, like the thimbleberries we’d see in the Upper Penninsula of Michigan. They made great jam, but these days who finds time to make their own jam? So the berries drop to the ground. Perhaps people should put a kid’s swimming pool beneath them, take off their shoes and make mulberry wine…. The berries we had were big and juicy and sweet! Yum! Isn’t it the little things we discover that can sometimes be the most rewarding? A little shop here a beautiful garden there. I’m now going to go hunting around our village. Lovely post. Thank you Gavin. The experience of using the recorder for some reason made me more aware on subsequent walks, even without it. I actually felt a little guilty about the photo-taking. In the recording, I can hear myself saying – “now Paula, are you being mindful and noticing things for their own sake, or are you illustrating your blog post?” But I do understand what you mean, Julie. A ramble with a camera can be a lovely thing. Yes indeed. And I love davesgarden.com. Thanks for stopping by, Daphne. 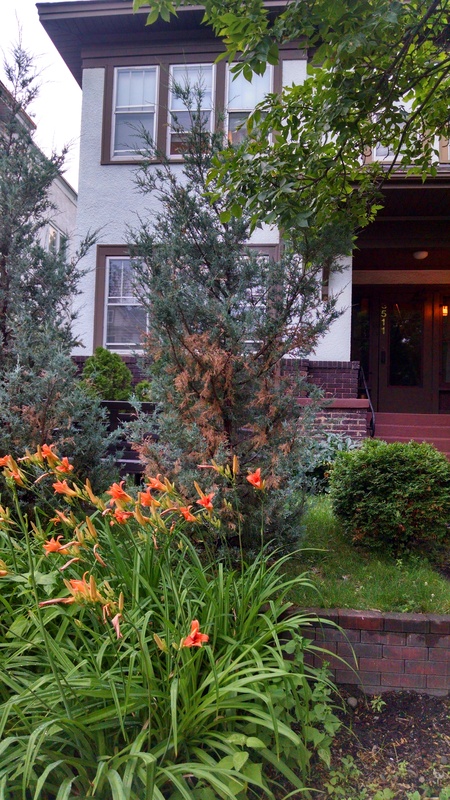 I have a big, overgrown, perennial flower bed, along with a few smaller ones. I have an abiding love for daylilies and Asiatic lilies. They give so much and expect so little in return. Roses are fussier–but beautiful. My friends snub “ditch lilies,” but I admire them. “Ditch lilies?” Well, heavens. I think your friends are missing the point. 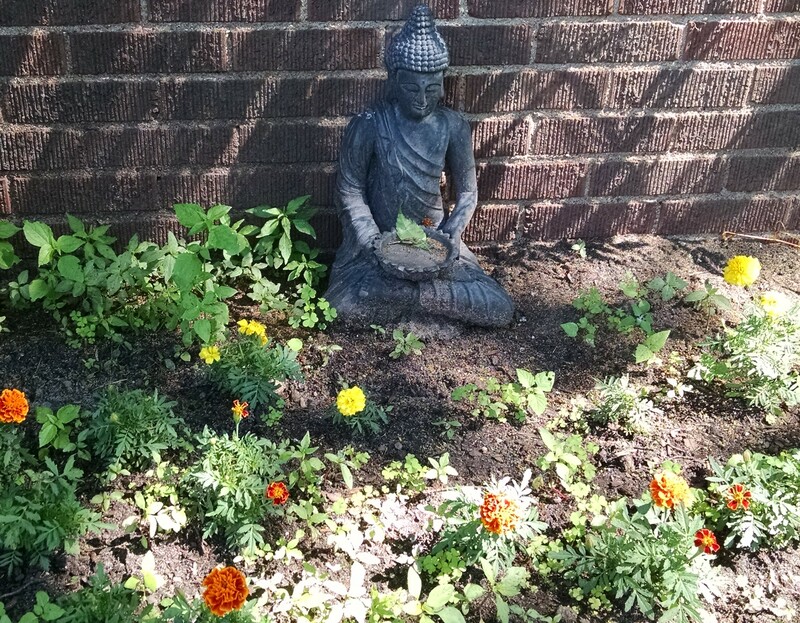 Personally I am far happier enjoying a garden that requires minimal care; the biggest issue I had was figuring out how to plan for year round color and interest. Even in winter, this can be done. I’ll let those with more time than I have tend to fussy beauties. I often forget that i have a camera in my phone, though am making an effort to remember lately, and actually, Iv’e been pleasantly surprised by some of the shots. Not quite up to the same standard as my camera delivers, but not bad… and of course, with pic monkey even the poorer shots can be bought up to an acceptable standard. Thank you, Kimmie! A trip home or so ago, on the plane, I was pulling things out of my under the seat back, looking for a book or something, and accidentally left my camera in the seat. I’m very bad at going back to lost and founds, and when you lose something on a plane it seems especially hopeless anyway – who knows what lost and found it will end up in. So now all I have is my camera phone. But at least now I’m not always forgetting to bring the camera to special occasions. It’s reliable therapy. Take a walk and look carefully at what’s there rather than listening to the constant barrage of words and feelings cycling and recycling through my mind. I walked with a friend last week. The evening sky was luminous. He didn’t notice. I pointed it out. He glanced up and kept right on talking. I paused to look at Venus and Jupiter, but soon gave up. Meditative walks need to be taken alone. Yes, that is very true. There are some friends you can walk quietly with, but they are few. Lately there’s been a movement to bring more exercise into the workplace, and people are now talking about “walking meetings.” Aargh! I am with Thoreau: I have no walks to throw away on company. You’ve inspired me to take a walk! Bless you! Thank you, Jan. I hope your walk was a blessing too. I like Elaine’s comment: It’s reliable therapy. :-) So true. I love walking, espcecially when I’m truly “there” and paying attention to everything around me. Great post. Thank you for the Artist’s Way quote, Paula. I read that book more than ten years ago, but of course didn’t remember this essential point. If I paid more attention, I wouldn’t have to learn everything the long hard way. Beautiful post, Paula. I walk with my pooch every day, but hardly ever pay attention to what’s around me, preferring to “space out” most of the time. Here’s hoping I can be more mindful today! Actually I think there’s a place for “spacing out” as well. I’m guessing we need both. Whereas the pooch’s needs are a bit simpler. A great post to remind us to pay more attention to the world around us and to just be in the moment (something I forget to do…Alot! Bit of a daydreamer). Loved seeing your photos too! Yes. It can be fun to get a bird’s eye view of someone else’s rambles now and again. It’s been an almost intimate experience with others in the class that way.